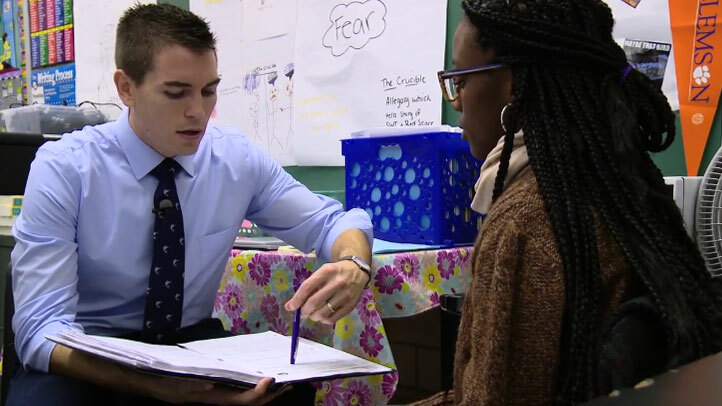 The 2014 National Teacher of the Year, Sean McComb, works at a pretty average-looking high school. Patapsco High School and Center for the Arts isn't a school with extra funding or special dispensation to try something totally different. Students sit at desks, they rotate through periods and, in many ways, the school hasn't revolutionized what it looks like to attend school. But, even within this traditional-looking environment, McComb is continually trying new things in his classroom. This year he's challenging himself to do a better job of letting students follow their own unique learning path by tailoring how he teaches to the individual. In this Teaching Channel video, McComb leads a class period where he's trying to give individual students feedback as they work and not only after they've turned in their assignments. He demonstrates how he tries to hold back from giving them the answers, instead guiding them with questions, making sure they are aware of and are using resources, and crucially allowing them the time and space to think through what he's asking and arrive at a solution on their own. McComb is doing a lot in this lesson. He's helping a few students work on a specific skill they lack; he's checking in on students working independently; he's conferencing with students who are having individual problems; and he's trying not to just give students the language that will improve their writing. McComb calls this practice a structure that's flexible and allows for short cycles of work that give him an opportunity to address problems and give real-time feedback. He's hoping this new approach to writing feedback will not only improve his students' work, but will also help them to become more independent learners. Teachers often focus on the feedback they give students and can even feel frustrated when students ignore carefully written comments on returned work. Less common is taking the time to get feedback from students on how they experience a teacher. As a way of fostering transparency, strong relationships and student voice, McComb asks his students for specific feedback about how he's serving them as a teacher. To help students feel safe, he has asked student leaders to discuss with their peers and bring the information back to him. "This strategy calls on me as the adult to have the courage to be vulnerable," McComb says in the video. He also hopes giving students the opportunity to address their frustrations makes them feel that he cares about them and that together they are in a partnership for success. McComb notes he can't change how students feel, but he can change how he reacts to their feedback. He plans to gather student feedback this way quarterly, rotating student leaders each time, and incorporate it into his work.